The media has started to play its role ahead of the Test series. Former South African superstar AB De Villiers once said in an interview that the Australian media is the worst in the world. One might find it little too harsh from someone like AB, who is well-known for his stoic like poise, but there is hardly an iota of doubt about how ill-mannered certain sports journalists from down under have been over the years. Having that been said, an Australian newspaper has tried to ‘hit the raw nerve’ of yet another visiting team with a headline that reads, “The Scaredy Bats” referring to the Indian team after their arrival in Adelaide ahead of the first Test of the highly anticipated series, starting December 6. 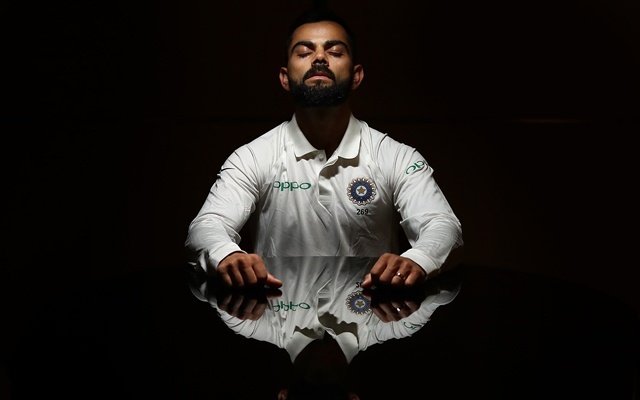 The report supposedly states that the Indian team, led by Virat Kohli, fears the bouncy tracks at Brisbane and also of the ‘unknown’ in Perth and the dark in Adelaide as they decided against playing a day-night Test, citing lack of preparation. Richard Hinds, an Aussie journalist, posted the picture of the controversial headline on Twitter and he seemed to be anything but unimpressed about the newspaper’s efforts which could turn out to be affecting the image of the country. Brydon Coverdale, a popular Australian quiz personality, also shared his views on Twitter by pointing out how well the likes of Kohli, Murali Vijay, Ajinkya Rahane and KL Rahul batted when they toured Australia last time in 2014-15. The fans of Australian cricket team have also had their share of putting the visitors off balance by their insults in the past. That is not the case this time around as they came in support for Team India on Twitter. The whole thing, according to several of them, looks silly and completely unavoidable. With the Test series not too far away, the Australian media has added yet another feather to its cap of ‘infamous reportage’. The anger and frustration from fans is totally understandable, given that the home team has been going through one of its most difficult phases ever since the ball tampering scandal and such remarks against the visitors can only add more insult to injury. Rule number1 – don't stir up Kohli. Rule number 2 – See Rule number 1. I don't think anyone's scared of Australia's team. I was tired of it around 2003..the media in Australia has to take a hard look at itself just as much as the men’s cricket team does. Justin Langer and Tim Paine should have a quiet word with the editors of these rags and state emphatically that these cheap jibes are not wanted. To be honest, I'm sick of the Australian media attacking our nation's cricket team. The amount of brown nosing towards India is disgraceful. Yep, its kids stuff Richard, shows a lack of class and a lot of disrespect. Not surprised though, its usually those who have never achieved anything in the sports world that come up with these ridiculous headlines. 100% agree. We are not in a position to be mocking anyone. We are cheats. No wonder Aussie media is shameless, you guys have @DennisCricket_ as a representative here on twitter too. Was Virat Kohli’s ‘bat does the talking’ gesture after Perth ton aimed at Pat Cummins?